You would be right. During the winter, the crowds thin out, the pageantry fades, and Galveston becomes the table of nerdy history types, introspective artists, and soulful adventure seekers. Summer in Galveston might be thrilling people watching, but staying on the island during the winter will introduce you to the people and places that make up the soul of this island. So true. It’s too unique to be called an old-fashioned Christmas, but that’s what it is. Dickens is a street festival celebrating the Victorian-era that attracts 75,000 visitors every year. At Dickens you’ll find Victorian Christmas carolers, thespian groups, art vendors, and parades. Dickens on the Strand is the opposite of Black Friday. If you’re sick of the same tinny soundtrack of ‘Rudolph’ playing in a crowded mall, head to the Strand for real bagpipe bands, roasting chestnuts, and gorgeous decorations. Get your party on in February. Galveston is home to the largest Mardi Gras festival in Texas, attracting up to 200,000 party-goers each year. Since 1867, Galveston has thrown this huge party, featuring marching bands, outrageous floats, and elegant balls. Join the festivities and catch handfuls of the 4 million beads thrown each year. You’ll discover that Galveston is the perfect size for Mardi Gras. Large enough to host unique parades (pet parade, anyone?) but small enough that the rambunctious crowds still head to Louisiana. Originally a bathing-suit-rental business, Murdochs has changed in its more than 100 years to give beachcombers exactly what they need today: a place to take a break. Among the bright, wide aisles of shells and unusual gifts are comfy rocking chairs for sea gazing. Relax on the huge deck, gaze at the waves, search for dolphins, and marvel at the Pleasure Pier rides. Remember, you’re standing over a tough bit of beach. After each major hurricane, Murdochs has been rebuilt. If you want to taste Gaido’s incredible oysters, you’ll need to visit in the winter. This iconic seafood restaurant can serve 2,500 diners each night, so you can bet there’s a table waiting for you right now. Go ahead and read this blog entry about how much fun overprotected kids have hunting crabs on a dark beach. Take your nets, flashlights, and giggling little ones and head out to the sand for an after-hours adventure. Bundle up! The Gulf winds are strong. Check out what’s swimming out of sight at the Galveston Fishing Pier. Take a look at the pier’s Facebook page to see the serious sea creatures you might catch hook, line, and sinker. Rent a pole and buy some bait to try your luck at catching stingray, sharks, and eels. Since it’s winter, it won’t be freak you out that you spent the day swimming next to these sea creatures. If you need some water in your winter, lose your bah humbug blues in Schlitterbahn’s eleven winter watercoasters. By visiting during a winter weekend, you’ll save $28 per ticket. You’ll save yourself the headaches that come with navigating Schlitterbahn’s summer crowds. This place is huge, but so much more manageable when you’re not with hundreds of other thrill-seekers. If you’re looking for a big, bright Christmas celebration, you’ve got to check out the Festival of Lights. Be awed by more than 1 million lights shining from the 100 sound-enhanced light displays. Your kids will love to skate around on area’s only outdoor ice skating rink in the area and try out the new Arctic Ice Slide. Riding along Seawall Boulevard will bring a smile to your face. It just will. If your kids aren’t bike-riding age, rent a surrey. Ride over the The Spot or Joe’s Crab Shack for drinks and a view. With fewer tourists on the island during the winter, you’ll have the best seat in the house for dolphin spotting or wave-gazing. A few givens: Pleasure Pier is expensive, it’s scream-your-head-off fun, it’s crowded, and your family will love it. What does all this mean? You’ll want to visit Pleasure Pier during the winter. On New Year’s Eve and New Year’s Day, Pleasure Pier offers All-Day Ride Wristbands for $15.99 and half-price walk on passes for $5. If you’ve been meaning to check-out Pleasure Pier, winter is the time to do it. Take a tour of the Moody Mansion, a single-family home for most of its history. The Mansion contains the Moody’s unique collection of furniture and decorations. Also, check out the East End Historical District’s Victorian Christmas Homes Tour. Peek inside these private homes to see the great taste–and wealth–that lives on the island. What’s more fun than Santa running a race? Thousands of Santas running for thirteen miles. Half marathon and 5K runners compete in Santa suits and beards along the Gulf and historic downtown streets. Along the route, participants can stop at cookie and candy stations while they enjoy holiday music. This secret free fun on the island isn’t so secret. Tens of thousands of riders line up to ride the ferry throughout the summer months. During peak tourist season, car lines can get long and tempers can get short. Ride the ferry in the winter instead. Riding the ferry is free fun, offering a visual reminder of the expansive sea surrounding Galveston Island. On your thirty-minute (round trip) tour, you’ll see dolphins, other ships coming into port, yachts, and a rare collection of birds. Best of all, the second floor is a climate-controlled seating area, so you can step out of the strong sea breezes to warm up. Every December, and only in December, Galveston becomes a bed and breakfast–for some huge majestic birds. In winter, the Sandhill Cranes visit the Galveston shores, and wildlife enthusiasts gather to welcome them. Come to the island for Breakfast with the Sandhill Cranes December 14-15. 15. Be a Tourist. For Real. What do most tourists do on the island? Over land, sea, or air, visitors take a seat to learn about the magnificent historical and land marvels of this little island. During the summer, tourists cram onto the island’s most known tours. But in the winter? Smooth sailing. Or riding. Or flying. See the water by land and by sea on the Galveston Island Duck Tour. For an old-school tour of the island, step up to the Treasure Island Tour Train, also known as the pink train. It takes you through a variety of neighborhoods so you can learn the history of the island from one end to the other. Or, take an aerial tour of Galveston for a view you can’t get any other way. Nothing explains why you should visit Galveston in the winter better than this: one of the most popular tourist attractions are the East End National Landmark Historic District’s tree sculptures. The polluted, salty waters from Hurricane Ike killed thousands of trees across the island, but homeowners salvaged these trees by commissioning remarkable pieces of art from the remains. Sculptors have breathed new life into the downed tree trunks and branches, and you can check them out on a guided tour. Art, innovation, history and a determination to restore what hurricanes have destroyed…thisis Galveston at its finest. Check out the calendar for a show you’ll love. You’ll find one. Guaranteed. No, it’s not bathing suit and flip-flop season, but Galveston beaches aren’t closed. Nothing, nothing, offers you perspective like taking your frazzled brain to the shore. Walk for miles, listening the constant crush of waves, watching the nonchalant pelicans and gulls diving for dinner, and smelling the sharp, salt air. Twitter Feeds and to-do lists suddenly seem like micromanaged silliness, don’t they? With more than 30 miles of beachfront to walk and think, you’ll run out before the sand does. If you need a truly unique Christmas gift, give an airplane ride in a restored historic plane. For about the same amount of cash you’d spend on a nice watch, your lucky loved one can see Galveston from the air. When you finish your airplane ride, tour the Lone Star Flight Museum and see more than 40 restored aircrafts, most of which still travel the country to air shows. With cooler weather, playing in the waves is not an option. Perfect. Turn your attention to other places the island shines. As a busy port, the railroad has been an important part of Galveston’s history. Now, trains are part of its present. Check out the rail yard at Galveston Railroad Museum. Young Thomas the Tank Engine fans will love exploring actual trains. Older visitors will be amazed by the importance of Galveston as a cargo port. Everyone will leave happier—and a little more knowledgeable about how ships and railroads keep our country moving. Baywatch Dolphin Tours has discovered what Galveston visitors want to see: dolphins. Summer or winter, warm or cold, these captains take boatloads of people out to spot the graceful creatures frolicking in the waves. Try a dolphin tour during the winter, when you’ll only need a sweatshirt instead of sunscreen and patience for the crowds. In October, Artoberfest takes over Postoffice Street. A street fair of artists from across the state and region, Artoberfest gives you the chance to celebrate the funky side of Galveston, while building your personal art collection. Galveston’s downtown will sparkle like it never has before. Saengergest Park will be transformed into a holiday celebration. Ring in Christmas with free nightly laser-light shows, music, and snow flurries. Check out the historic downtown like it’s never looked before from November 30-December 31. Play a round at Magic Carpet Miniature Golf. With 18-holes and spectacular water views, the whole experience is both silly and awesome. Open year-round, putt-putt golf in the winter is nicely refreshing, and sans the sweat. The constant breeze from the Gulf offers perfect conditions to fly a kite. Visit a gift shop to find a fancy one or run along the shore with a simple one. That’s the thing about kites: the pleasure is so simple, you can’t mess it up. Especially on a deserted beach. Add any Galveston attractions I missed in the Comments. Share this list on Facebook and tag anyone who might like a couple days off to relax in Galveston. 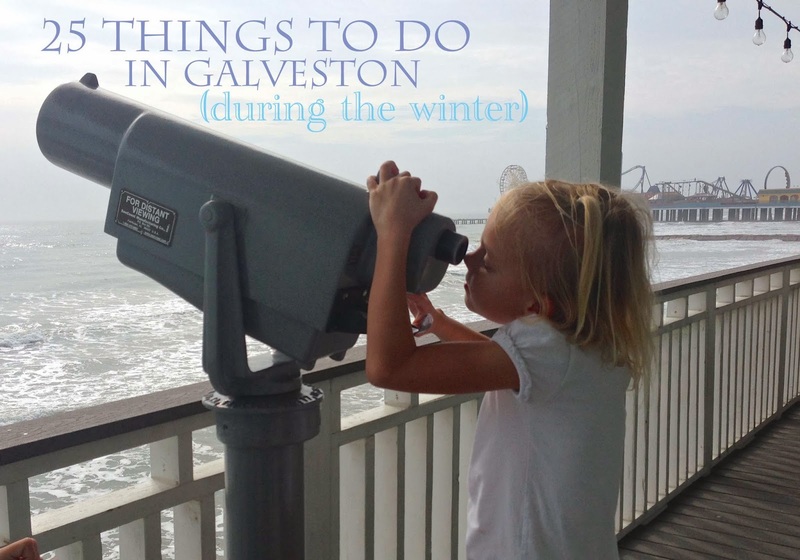 Most importantly, decide what you want to do this winter in Galveston and come on down! If you need a place to stay, Best of Times is open all month. Want to Go to Galveston for the Weekend?